Before M was born, we spent ages choosing all of the furniture needed for her nursery. I needed it to be perfect. I spent hours (and a small fortune on tester pots) choosing the right colour for the walls. The thing that we found hardest, though, was choosing the perfect cot bed for her. So many of them looked cheap and flimsy to me, and we really wanted something that would last. This is mainly why we chose a cot bed over a cot. We wanted to be able to just turn the cot into a bed when the time came, rather than having to buy yet another piece of furniture. We were thrilled when the found the Kingston Cot Bed at Mamas and Papas. I spotted it when we visited the Baby Show in London and I knew instantly that it was ‘the one’. Second time around, this baby isn’t getting quite such the luxury treatment! We’ve already got most of the equipment needed from having M, including all of her clothes. I’ve decided that the spare room is a perfectly adequate colour, so there’s definitely no need to repaint (I think it’s the same colour as M’s was before we painted it!). We also love the M’s cot bed so much that we thought that would be a total no-brainer. We were simply planning to buy another one. Imagine my disappointment when I realised that Mamas and Papas no longer sell the Kingston! Noooooo! I wasn’t the only one to be disappointed on that front. 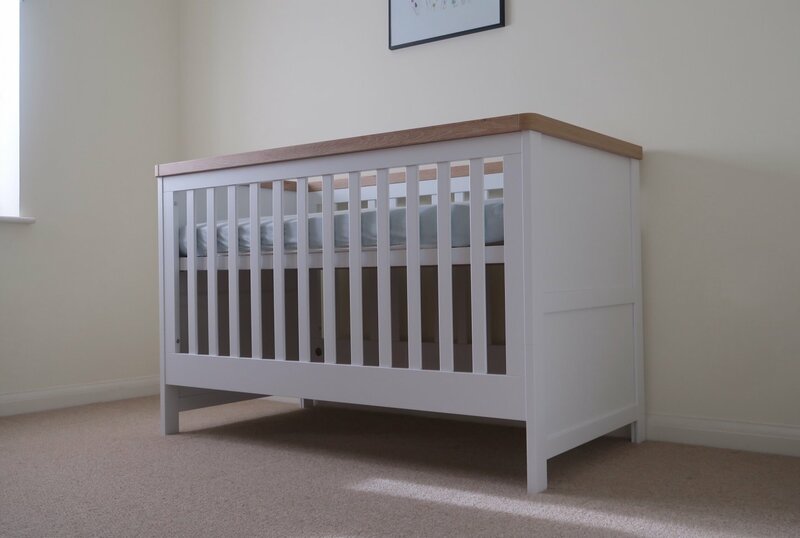 I even had an email from a lovely man who had come across my blog and wanted to know if we’d be prepared to sell him our Kingston as his wife was also expecting baby number two and they were hoping we might have finished with it! No such luck, but I did admire his determination to track down another Kingston! Anyway, so began the search for an alternative to the Kingston. All I can say is thank goodness our girls won’t need to share a room, as I don’t think I could have coped with the idea of mismatching cot beds in the same room! 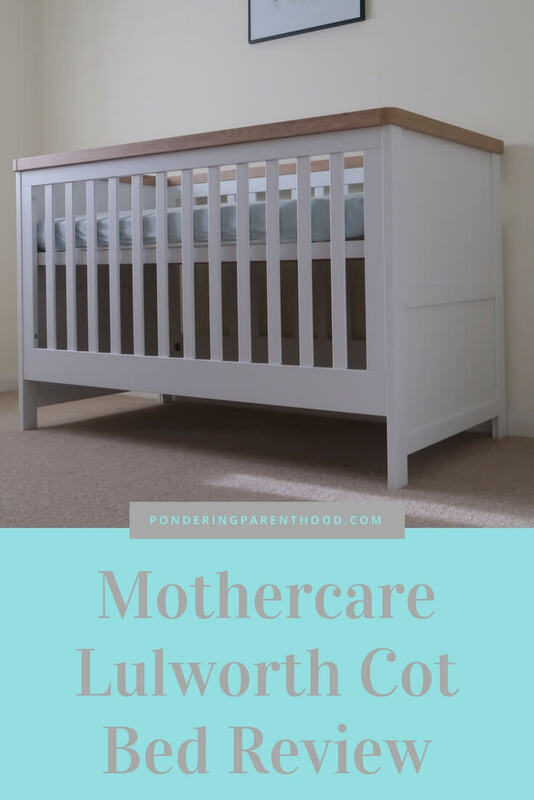 Eventually, though, I came across the Lulworth Cot Bed from Mothercare. It’s not dissimilar to the Kingston, but not quite the same, either. I was a little bit wary about ordering the Lulworth as a lot of the reviews mention parts missing, sections damaged and poor delivery. I bit the bullet, though, and am pleased to report that we didn’t have any problems with our Lulworth. The delivery men did try to just shove it in my kitchen and run off instead of taking it upstairs. Despite me being forced to pay £10 to have it delivered to a room of my choice. And they also got mud all over my carpets when they did eventually take it upstairs. Oh and they hurriedly assured me that everything was fine with the cot bed (despite the box being half open) and practically forced me to sign their little machine thingy without allowing me to check it myself before running away. So maybe the delivery part being fine was more by luck that anything else! I was still unsure as to whether I really liked the Lulworth. However, once we’d put it together and got it into position, I couldn’t be happier. It was fairly straightforward to put together (although it did need two of us) and all of the parts were there. I really like the contrast of the brown wooden top, with the white frame. It’s also very sturdy and feels very well-made. I’m confident that it will last this new baby well, which is the whole point of choosing a cot bed over a cot. Once the cot bed was sorted, I just needed to find a mattress, mattress protector and some nice fitted sheets. I’m a firm believer in following the Lullaby Trust’s advice and having an empty cot, so I don’t bother dressing the cot with pretty blankets, pillows, toys or cot bumpers. I do like a nice sheet, though, and bought a cute twin pack from John Lewis to start us off. Fortunately, the lovely people at Kiddies Kingdom (incidentally, Kiddies Kingdom’s range of cotbeds is vast, too!) 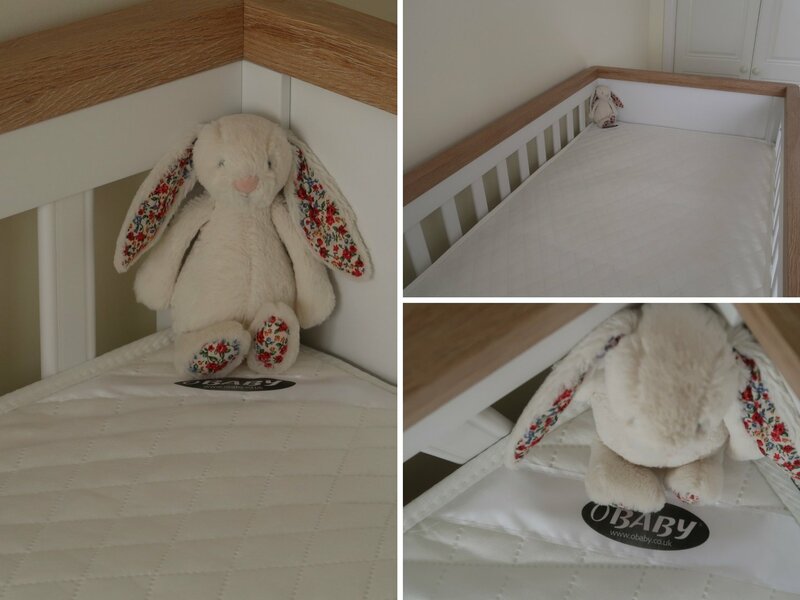 sent us this Obaby sprung cot bed mattress and mattress protector to try, so that’s taken care of that aspect. It’s hypoallergenic and has a washable cover, so I’m hoping it will be perfect for our needs. Now we’re just waiting for the rest of the nursery furniture to arrive. Then we might feel like we’re ready for this baby!